Are you ready for medicine's future? Telepaxx makes sure your digital transformation succeeds. Connecting medical data with all involved parties. Thus improving medical care. Free your medical data - images, videos etc. - from long-term technological transformations and increasing data volumes. With e-pacs vendor neutral archiving. Certified with the renowned German Data Privacy and Protection Seal of Quality. Enable collaboration between healthcare professionals and patients via medical data sharing with HealthDataSpace (certified with the German Data Privacy and Protection Seal of Quality) e.g. for tumor boards or second opinions. Improve patient treatments, quality assurance and research findings classifying medical data with the latest clustering technologies in big data analysis. Available for individual clinic infrastructures and servers. Via medical archiving, data sharing and deep learning we connect medical data with all involved parties thus improving medical care. More than 600 clinics and imaging centers – amongst them the largest clinic corporations in Germany – trust us with archiving over 13 billion medical images and information. We consistently encrypt all medical data with a public and private key and store it solely on servers in Germany while keeping at least two copies of each file in two separate data centers at all times. Our solutions e-pacs and HealthDataSpace are certified with the renowned German Data Privacy and Protection Seal of Quality. 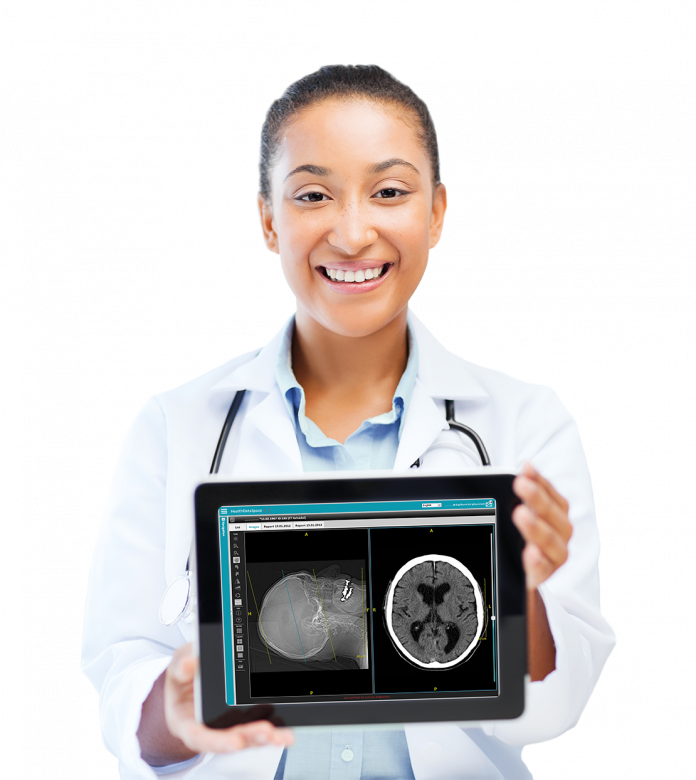 We are highly trained professionals with a long-standing experience in the healthcare and IT industry. We work with agile project management methods and creative techniques to solve problems and to develop new ideas. Our customer support is highly qualified, receives regular training and works with a modern CRM software and knowledge database. We only use high-quality materials and hardware for our customers e.g. from our long-term partner Dell. We consistently encrypt all medical data with a public and private key and store it solely on servers in Germany. We ensure the quality of our services via regular internal and external audits e.g. by the German Data Privacy and Protection Agency. We store at least two copies of each file in two separate data centers at all times and we maintain our data centers regularly. We select our partners very carefully ensuring that they are a good fit not only for us but for our customers, as well. Together with our partners we are currently exploring the ways how deep learning may generate automated second opinions from individual clinic infrastructures or servers to support radiologists in their decision-making. Our secure medical archiving and data sharing solutions make occupational medicine more efficient and convenient. We joined a project sponsored by the Federal Ministry of Education and Research to develop health apps aiding patients with psychological diseases. We are currently creating new features for our online community HealthDataSpace to connect healthcare professionals caring for children with heart failures.